Warthogs stand 60 - 70 cm / 23 - 28 inch, and have a mass of 60 - 95 kg / 132 - 200 lb.. The head is big in proportion to the rest of the body. Elongated head with a broad snout. Characteristic features are the distinctive facial warts on either side of the face. Boars have two pairs of these, a very large pair rising from the skin just below the eyes and a much smaller pair on the cheeks between eyes and tusks. Their upper tusks swing sideways in a half circle, upwards and curl slightly inwards. The lower tusks, whose edges and tips are kept sharp by occlusion against the upper, are a sharp weapon. Thin bold tail with a terminal tuft of hair which is characteristically held in an erected position when running. Back-grey. The body is covered very sparsely with coarse bristles. Adult animals are almost bold. After a bath in red soil, warthogs may appear red in colour. Bush and grass savanna, dependent on water and usually found near a water source. They feed on all things they can get, although carcass, insects and small mammals, roots and tubers which they dig out of the ground with their tusks, grass, berries and plants. They drink daily, often in the late morning or afternoon. Warthogs are gregarious in more or less bigger groups, always near water source. 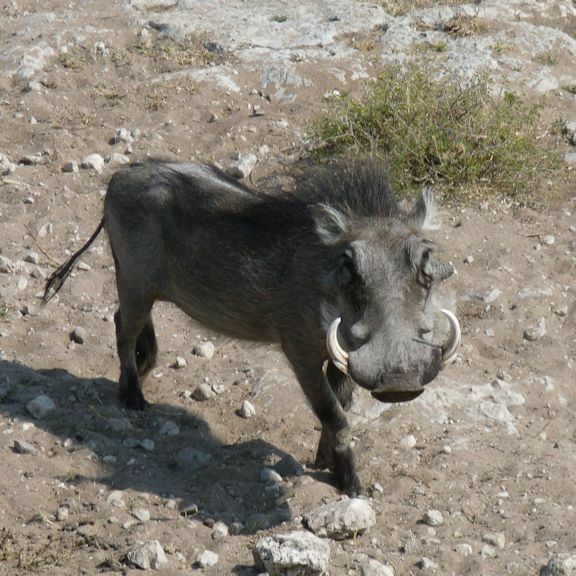 Adult male Warthogs are often solitary. They like to sleep in leaved holes of aardvarks in which they push into backwards. They are diurnal and very territorial. The trophy is the tusks. The length of an upper tusk may be up to 40 cm / 16 inch.